I’ve been greatly amused by Cisco’s attempts at thought leadership in the Internet of Things (IoT) space, especially as (so far) they’ve contributed nothing to it. The Internet of things is not the Internet of big things; in a post- Raspberry Pi world, it small sensors matched to simple electronics, controlled by cloud services using open(ish) APIs. None of which, as far as I can tell, have anything to do with Cisco. Every couple of years I take a look at the home control options and have found the pretty lacking. The old x10 systems were pretty cranky, expensive and not especially family friendly. I didn’t want a Windows or Linux PC running just to turn the lights on. Well, it would seem the future is finally here. The first Internet of thing I bought was a Nest Protect smoke/carbon monoxide alarm. After a series of impulse purchases, I now have them working together in a (relatively) meaningful way. Together, they make up a limited set of tools in the house which are linked together. The are various use cases for home-IoT, but for me most of them revolve around physical security and energy efficiency. The Nest Protect was necessary after my existing smoke alarm died; (I say died, it started randomly going off in the middle of night; it would be more correct to say I killed it). Seeing how well it worked I pushed on. The next purchase was the Quirky spotters. These hockey-puck sized devices are general-purpose sensors for movement, temperature, humidity, light, and loud noises. Whilst there are many ways to crack this nut, what attracted me was the price and the relative simplicity of their operation. As it turns out, it’s little too simple to be really useful, but all of this can be fixed in software. I hope. My property has a separate garage which I don’t have line of site from my house. Whilst I don’t keep anything terribly valuable in there, It’d be nice to know what is going on, and monitor the temperature as it’s not that well sealed/insulated. The biggest downside is that only the movement sensor is actually usable when running on the 2xAA batteries, to get the other sensors to work, you need the mains adaptor which runs at a paltry 3.3v and a handful of milliamps. You can set up notifications (or robots) on the spotter when certain actions occur; e.g. alert me if the temperature drops below X, or the lights are turned on. Fortunately there is a bug (for the moment) that allows you to set up robots when the spotter is plugged in, that still work when running on battery, albeit intermittently. As a result, I’m getting fairly regular temperature updates and notifications if someone tries to open my garage door (so far, only me). The other idea is to retrofit my “legacy” home with better security. I want to use sensor to notify me if the doorbell rings or the wired alarm sounds. However, this is one of the little “features” of the spotter; there is no way to tune the sensitivity of the microphone, and it’s doesn’t actually record what triggered it. As a result, if I just leave the noise sensor on in an otherwise empty house, I get alerted 15-20 times a day of mysterious “loud noises”. 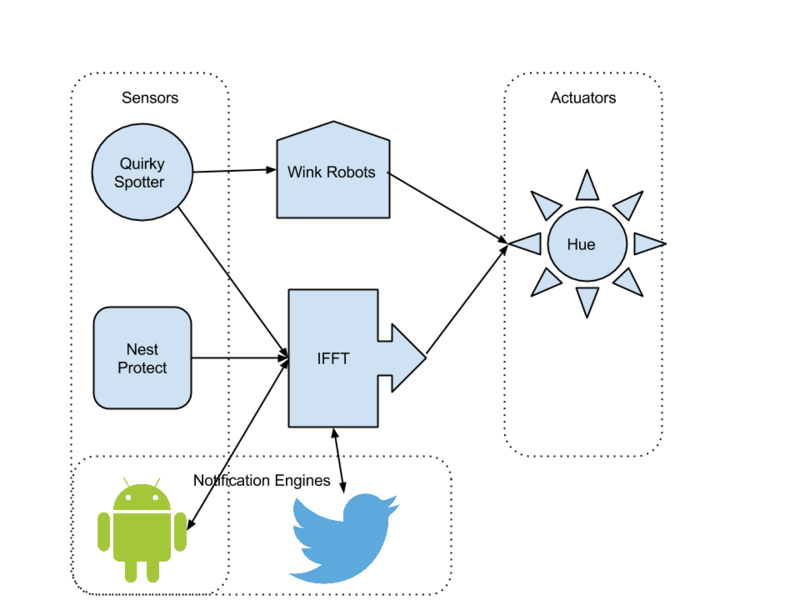 The next step is a Nest Thermostat, which will be the subject of my next post.